Seksy wristwear by Sekonda proudly presents this unique timepiece as part of their Seksy Rocks® collection. Featuring a silver tone case and bezel embellished with Swarovski® crystals, and completed with a black stone-studded bracelet made with crystal fine rocks by Swarovski®, this watch is perfect for a lady wanting to add something special to her watch wardrobe. 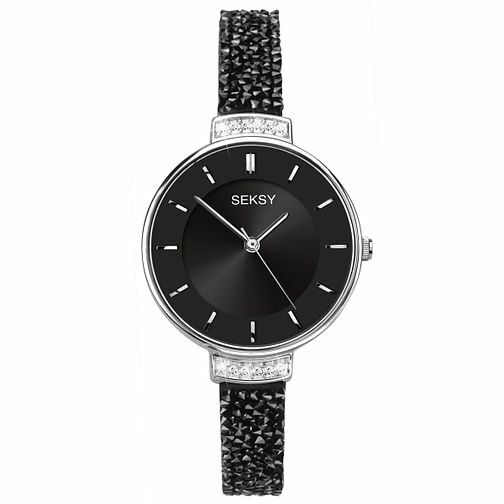 Seksy Rocks® Ladies' Stone-Set Black Strap Watch is rated 5.0 out of 5 by 2. Rated 5 out of 5 by Anonymous from lovely Watch very elegant watch can be worn daytime or evening time and will go lovely with the rest of my jewellery.